WILLIAM BEAUREGARD BLOUNT was born Abt. 1855 in Neshoba County, Mississippi, and died Bet. June 25, 1890 – June 1900. 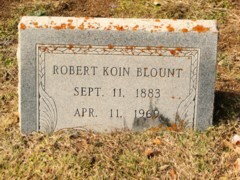 He was the son of James Koen Blount and Lydia Ann Moore. He married MARTHA ADELINE WATSON July 30, 1882 in Llano County, Texas. She was born Abt. 1865 in Texas. WILLIAM BUCK BLOUNT b. March 19, 1886, Sutton County, TX; d. July 31, 1953, Kerr County, TX. WILLIAM BUCK BLOUNT was born March 19, 1886 in Sutton County, TX, and died July 31, 1953 in Kerr County, TX. He married MAYME LESTER WHELSTINE June 30, 1912 in Kerr County, TX. She was born July 04, 1895 in Texas, and died May 07, 1993 in Kerr County, TX (Source: Social Security Death Index.). The SSDI states her last residence as Kerrville, Kerr County, TX. Texas Deaths beginning with 1964 states that she died in Kendall County, TX. MILTON DEE BLOUNT b. April 25, 1915, Texas; d. December 02, 1969, Kerr County, TX. MILTON DEE BLOUNT was born April 25, 1915 in Texas, and died December 02, 1969 in Kerr County, TX (Source: Texas Deaths 1964-1998.). He married NORMA GENE DANFORTH. KARRELYN BLOUNT married JOHN ALLEN STEPHENS. JOHN ALLEN STEPHENS, b. Abt. 1967.